Florida Panther (Puma concolor coryi) Endangered- The Florida panther, Florida’s state animal, is one of the most endangered mammals on earth! 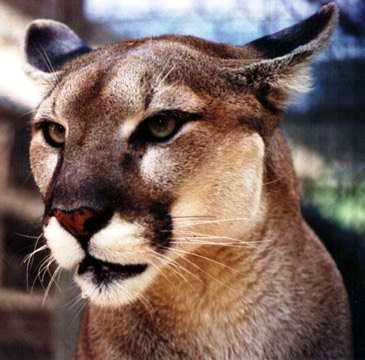 Also called puma, cougar and mountain lion, the Florida panther is a large slender cat, tawny on top with a whitish underside. The Male Florida panther averages 119 pounds and the female weighs around 82 pounds. Rather than the tawny appearance of some other cougars, the Florida panther's rufus pelage is highlighted with gray on the face, fore paws and elsewhere. Sadly, the number of Florida panthers remaining in the wild dwindled to somewhere between 30 and 50. Panther habitat includes swamps and marshes. Panthers eat mostly white- tailed deer, feral pigs, armadillos, and raccoons. They are solitary and territorial animals that travel hundreds of miles within their home range. Panthers are mostly active between dusk and dawn, and rest during the heat of the day. 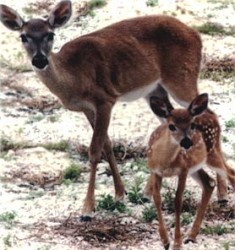 Males have a home range of 200 square miles and females about 75 square miles. Panthers are usually quiet, but they do communicate through vocalizations. Sounds they make have been described as chirps, peeps, whistles, purrs, moans, screams, growls, and hisses. Females signal their readiness to mate by yowling or caterwauling. Florida Black Bear (Ursus americanus floridanus) Threatened- The Florida black bear is the largest land mammal in Florida. A small population of the Florida black bear roams in the Chassahowitzka Swamp and the adjacent coastal wildlife refuge areas in Pasco, Hernando and Citrus counties. Larger populations occur in the Ocala National Forest, the Big Cypress Swamp and other protected wilderness regions across the state. Most likely between 1,000 and 1,500 bears live in Florida. Like all members of the bear family, black bears are large, powerful mammals with rounded ears, short tails, 5-toed feet, and large canine teeth. Adult males in Florida normally weigh between 250 - 450 pounds, and adult females in Florida normally weigh between 125 - 250 pounds. 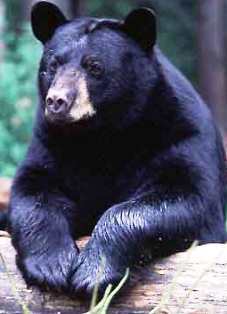 All black bears in the Southeast, including Florida black bears, are black. The muzzle may be tan or nearly black, and blonde or white chest blazes of all shapes and sizes are common. Black bears eat mainly acorns, nuts, berries, and other vegetation as well as insects. A small percentage of their diet is meat which is mostly obtained from scavenging. Everglades Mink (Mustela vison evergladensis) Threatened- Mink are semi-aquatic mammals and members of the weasel family, which include otters, ferrets, badgers, and martens. Minks can be found near rivers, lakes, and marshes throughout North America and Canada. The everglades mink is glossy, blackish brown with a long (20-24"), slender body, short legs and a long (7-8") bushy tail. It has small rounded ears and a white chin. The Everglades mink is currently believed to be limited to the shallow freshwater marshes and long-hydroperiod swamps of the Fakahatchee Strand, Big Cypress Swamp, and southern portions of the Everglades. Historically it occupied a much larger range covering much of the northern Everglades and Lake Okeechobee region; however because of the wariness of the species habits, there are no historical or current estimates of the size or density of the population. The everglades mink's diet is primarily crayfish, fish, and small mammals. Lower Keys Marsh Rabbit (Sylvilagus palustris hefneri) Endangered- The lower keys marsh rabbit is a small rabbit, averaging 14-16 inches in length. It has dark brown dorsal fir and a grayish underside. 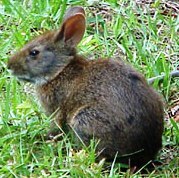 The ears of the lower keys marsh rabbit are relatively small for a rabbit, only 1.75 -1.92 inches. Unlike the cottontail rabbit, this rabbit's tail is inconspicuous, a dark brown above and gray underneath. The subspecies lower keys marsh rabbit is endangered and its range is limited to the lower Florida Keys.